Mystery Goose Press, 9781948882019, 266pp. 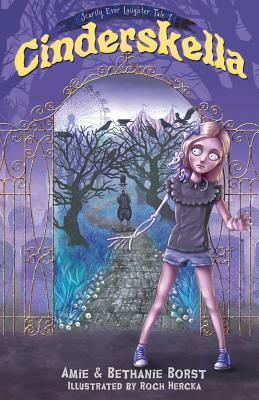 Cindy might appear to be your average twelve year old, but since her mother's death she has a secret. Every night she turns into a boney, white skeleton. As if that wasn't bad enough, Cindy's dad is afraid of her. She has an evil stepmother who makes her do crazy chores, some of them with a toothbrush. And then there's the werewolf with intentions of making Cindy his midnight snack. The Spring Fling dance is fast approaching and Ethan, the cutest boy in sixth grade, doesn't seem to know Cindy exists. She doesn't think letting Ethan know she's a cursed skeleton-girl is the best way to introduce herself. Determined to break the curse, Cindy travels to the Underworld where things aren't quite what they seem, including Mr. Death, the strange and creepy undertaker. With a jar of pickled pig's feet, a wacky fortuneteller, and a cranky skeleton mouse, Cindy is afraid this curse has really gotten under her skin. Amie Borst loves glitter, unicorns, and chocolate. But not glitter covered chocolate unicorns. That would be weird. She's a PAL member of the SCBWI as well as a founding and contributing member of The Mixed-Up Files of Middle-Grade Authors, a group blog dedicated to middle-grade books. She's also a judge on Rate Your Story. While she'd like to travel the world in a hot pink elevator, she's content to write more books from the comfort of her home in Virginia. You can find her on her website. Bethanie Borst is the 17 year old mastermind and co-author of the Scarily Ever Laughter series. She was only 10 when she wrote Cinderskella. She enjoys reading, writing, and STEM. Someday she'd like to work for NASA as an aerospace engineer. Bethanie is fluent in both sarcasm and humor and is prepared for the zombie apocalypse and/or spontaneous combustion of the world. Because, let's face it, both of those things are totally legit. Learn more about Bethanie at her website. Roch Hercka is an illustrator, painter, and book lover. He has been drawing for as long as he can remember. Inspiration for his work comes from dreams (mostly the bad ones), spooky folk stories, and music. Roch has always been attracted to all things dark, scary and grim, while also having a fascination of the beautiful world around him. Roch is a fan of comic books, board games, movies, and food. He lives and works in Torun, Poland with his family and a cat.